Students from "Poetry, Painting, Film, and Music in New York City" viewing Meadow (1997) by Alex Katz at the High Museum of Art in Atlanta. As a Marion L. Brittain Postdoctoral Fellow at the Georgia Institute of Technology, I'm encouraged to teach first-year writing courses in rhetoric and composition that deeply engage with the content of my scholarship and research. Our program's multimodal pedagogy--in which students are consistently engaging with written, oral, visual, electronic, and nonverbal modes of communication--offers a unique opportunity to involve students, many of whom are engineers and computer scientists, in conversations about art, poetry, and aesthetics. The intertextual, collaborative, and generative experiments of New York School poets and artists are fertile ground for questions related to communication and design, and a challenging, imaginative space for students at a leading technical institute to engage in innovative research in the humanities. What would happen, I asked myself, what intersections could we discover, what new approaches to the New York School could we generate, if I turned the first-year composition classroom into a multimodal art house? This past spring semester, along with 60 first-year students, our course "Poetry, Painting, Film, and Music in New York City: 1960-Present" tested those pedagogical questions. Our immersive creative-critical look at the art of the New York School led to a series of student-made artifacts and original research projects that revitalized my sense of what's possible in a composition course. My past experiences teaching the work of New York School artists in a writing workshop or literature course has meant utilizing mimetic processes to encourage students to both experience and experiment with the formal techniques, source materials, and cultural spaces that make up a poem. However, the course objectives in our research-based composition course--for students to develop competence in all communication modalities and to understand how effective communication balances multiple modalities--meant studying the New York School to different ends. Rather than becoming New York School-inspired artists or scholars of post-WWII American poetry (though I would argue this happened anyway), students' primary goal was to establish and refine a working aesthetic vocabulary for the art and writing they engaged with. Deployed through a range of modalities, and working both individually and collaboratively, the New York School would become a lens through which students could reflect on and critique American art practices and contemporary American culture by creating research posters, podcasts, and a host of other projects. Early on in the semester, I encouraged students to accumulate aesthetic vocabularies by discussing and describing the work of visual artists. Students had a hard time feeling like they could comprehend a painting, for example, by Joan Mitchell, but through comparative exercises and encouraging students to imagine more specific, idiosyncratic ways of describing visual effects, they inevitably found different methods of approaching what they saw. Before "understanding" a painting or identifying an artist's intentions, students began to consider new ways to learn simply how to look at art. They were encouraged by the incredible 2014 book New York School Painters & Poets: Neon in Daylight, written by Jenni Quilter and edited by Ali Power, which became students' foundational text as they began to explore the contours of New York School aesthetics that include, as Carter Ratcliff describes in his foreword, an "astonishing array of verbal-visual hybrids." Bill Berkson's introductory question, "In collaborative works by poets and painters together, does the verbal support the visual, or does the eye go first and most hungrily to the words that are in or of the image?" was exactly the sort of inquiry into multimodal communication that our course needed. Students tested their ability to translate their attentive looking into an aesthetic vocabulary by, for example, articulating the aesthetic and formal differences between thematically similar paintings by Jane Freilicher and Alex Katz, then utilizing that conversation to describe alignments and divergences between groups of poems by Barbara Guest, James Schuyler, Kenneth Koch, and John Ashbery. Suddenly, what students admitted had at first looked like traditional landscape paintings became ways of approaching talking about the intricate challenges of avant-garde poems: the blurring of depths and mysterious invitation to narrative in the Freilicher painting began to resonate with Schuyler's "Freely Espousing"; the almost-cartoonish flatness and overwhelming surface of the Katz lithograph reflected the off-kilter buoyancy of Koch's "To You." The more they looked and read, the more students began to exchange received language like "random," "confusing," and "chaotic" for generative descriptors like "textured," "overexposed," and "composite." Using a course-specific hashtag, I would tweet about our class discussions to encourage students to return to the images and ideas we'd talked about in class. I wanted students not only to consider how course content changed when they interacted with it on social media but to also be aware of my professional presence in a larger contemporary conversation about the New York School. I wanted them to be considering the public facing future of their own research and how our in-class conversations interacted with others' ongoing scholarly work. Rather than narrativize the whole of the semester, I'd like to take the opportunity to feature some of the marvelous work my students produced throughout this class, much of which was influenced by our class visit to the High Museum of Art in Atlanta and benefited from student's original archival research at Emory University's Stuart A. Rose Manuscript, Archives, and Rare Book Library. A few of the projects I don't have room to feature here include some wildly creative work: the creation of sheets of Roy Lichtenstein stickers to blanket the campus with iconic pop art, a constructed 3-D model of a George Schneeman gallery exhibit in miniature, an app that applies an Andy Warhol-portrait over your own face in a selfie, broadsides of Bernadette Mayer poems with original artwork, manuscripts of Selected Interviews for artists like Lorenzo Thomas, Jean-Michel Basquiat, and Anselm Berrigan, a data visualization project on John Cage's "49 Waltzes For the Five Boroughs," a "new" issue of Alice Notley's 1970s-era mimeograph magazine Chicago, a Jasper Johns-inspired fashion look book, and a website dedicated to cataloging all of Joe Brainard's book and magazine covers. A detailed portfolio of student work can be found here at my website, which includes links to the complete course syllabus, individual artifact assignment sheets, and a sample of students' reflections on their work. In addition to personally adoring these projects, these examples showcase the range of potential deliverables students can generate when instructors are encouraged to merge their pedagogy and scholarship in innovative environments. My own contribution to this symposium--a digital publishing project that makes available all of the issues of the magazines edited and published by Alice Notley--is a direct result of working with my students on their own unique projects. 1. "Storytelling 101: The Effects of Linear vs. Non-Linear Chronology": This poetry research poster created by Angelica Weaver and Sultan Sayedzada for Artifact #1 explores how non-chronological time operates as a formal and thematic principle in The Sonnets by Ted Berrigan and Chelsea Girls by Eileen Myles. 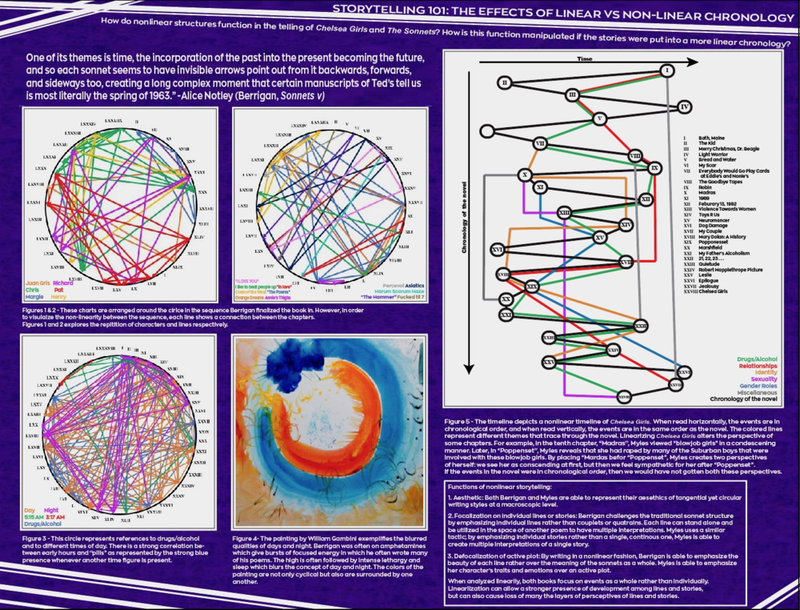 The circular visualizations on the left side of the poster present how names, phrases, and references to time repeat and vary over the course of Berrigan's iconic sonnet sequence. Their translation of book's repetitions into such striking visual representations, especially in Figure 3, allow us to actually see the radical intertextuality and dense, echoing patterns that make The Sonnets so haunting and memorable. The use of the painting by Abstract Expressionist William Gambini provides a surprising visual equivalent to their representations of time in The Sonnets while also reminding us of Berrigan's deep aesthetic affiliation with visual art. The visualization on the left tracks time and chronology, and the relationships between themes such as sexuality and identity, in Myles's novel Chelsea Girls, displaying the effects of Myles's non-chronological ordering of the chapters. As the students describe, "When read horizontally, the events are in chronological order, and when read vertically, the events are in the same order as the novel. The colored lines represent different themes that trace through the novel.” Angelica's description of their project in her end-of-the-semester reflection mirrors many first-time reader's relationships with the texts: "While reading Ted Berrigan's The Sonnets, I constantly found myself dumbfounded and confused, and I was known amongst my peers to be the one who could actually understand poetry. To me, the first time, it was a convoluted mess of repeating lines, but I found myself constantly trying to trace back through to find where I had seen those lines before. I was curious to see if I put together all poems with the repeated lines, then maybe it would make sense. Reading Chelsea Girls by Eileen Myles was no different; however, within their stories, it is possible to rearrange the stories based off of keywords that depict setting rather than specific repeating lines. My partner Sultan and I worked to create a visual representation of the connections." 2. "The Podcast That Never Sleeps: George Schneeman": This collaborative podcast by Carlos Sabater, Christopher Reny, Antoine Paletta, and Sriharsha Singham was produced for Artifact #2. Based on our conversations about New York-based visual artists, students worked in groups to produce podcasts that investigate a single work of art. Created in the style of The Lonely Palette, a podcast by Tamar Avishai that seeks to make art history accessible to the masses, this group chose to research the Second Generation New York School artist George Schneeman and his collage "Pipe Dream 2" (1986). Their conversation is well-organized, easy to listen to, full of subtle conversational techniques that recreate a natural progression of thought and make use of the podcast's affordances, supported with multiple forms of evidence, cleverly conceptualized around Christopher's performative expertise, and elegantly edited with effective transitions and music. I really learned more about Schneeman's work through their discussion of this particular collage. The progression of the conversation into representations of gender is especially compelling, but they also make an important subtle turn to suggest that while this reading is vital you can also see the collage more literally as this self-reflexive artifact. Their analysis is full of complexity and nuance. I think Schneeman would have been a little baffled and wildly happy to hear his work talked about so well in a podcast. This is a meaningful contribution to the scholarly study of Schneeman's work. 4. These trading cards--one series based on The Basketball Diaries by Jim Carroll and the other a series of paintings by Fairfield Porter--were created by Ben Student and Alec Pfeffer, accordingly, for Artifact #3. Ben's work for the Georgia Tech basketball team made this his project a no-brainer, and he took on reading The Basketball Diaries and researched Carroll as a way to find out the relationships between the New York School and sports. The featured card is one of three well-designed cards of Carroll that fully utilize the visual markers and design features of traditional sports trading cards. The "New York School Sports" website that Ben's friend Leo Ricci made for Artifact #3, another sports fan, wonderfully complements Ben's cards, showcasing the statistical data and ephemera of the two baseball games narrated in the books Yo-Yo's With Money and Beaned in Boston by Ted Berrigan and Harris Schiff, as well as a collection of basketball cards for all the players mentioned in Anne Waldman and Bernadette Mayer's collaborative The Basketball Article. Alec's Fairfield Porter cards also utilize the visual and textual affordances of the trading card format, resulting in a 13-card series that serves as an educational introduction to Porter's aesthetic and relationship to the poets of the New York School. 5. Both of these documentary videos, the first on the intersections of the Black Arts Movement and hip hop (created by Cameron Davis) and the second an editing of available and rare footage of Ana Mendieta provided to the student courtesy of Mendieta's family (created by Angelik Laboy), trace the intersections of race, identity, nationality, and aesthetics beyond the academically and culturally sanctioned (and mostly white) New York School artists. Both of these projects began in our class discussions of Amiri Baraka's Dutchman and Simone White's Of Being Dispersed. Angelik describes her project on Mendieta as an experience in learning to trust her own bravery as a documentary film maker and artist, reflecting on how "After examining all of her films, my interest sparked to explore the means in which she explored dislocation, reconnection, and belonging....With her work as an influence, the last artifact was created as an homage to her and aesthetically representative of her style. This particular project served [to allow me to] trust my creative side infused with investigative skills." At the end of the semester, students from all of the three course sections came together for a collective New York Research Showcase, an informal conference-style display of their individual final artifacts. During the showcase, students gathered in one corner for an impromptu poetry reading, reciting work by Notley, Baraka, and even The Migos. More pictures from the student showcase, which include more images of the wonderful student work I haven't been able to discuss, is available to view on Flickr.